Mikaela’s first experience working in the health and wellness field was as a group fitness instructor at Aquatic and Fitness Centers in South Delta. Many of her clients lived with arthritis or other conditions that made being active painful. She enjoyed being able to help them live more active lives, but found that she desired the ability to impact people’s lives to a greater extent – not just by helping increase their fitness level, but relieving their pain – which was not something she could do as a group fitness instructor. Mikaela found she was able to accomplish this as a graduate of the West Coast College of Massage Therapy. In her time there she gained experience with athletes while working at the LululemonSeawheeze; Krankworks; and with UBC Varsity athletes as well as with people with various ongoing health concerns through in-reaches at the school clinic. Since graduating Mikaela has gained more experience with motor vehicle accident related injuries, repetitive stress injuries, postural pain, and sports injuries. 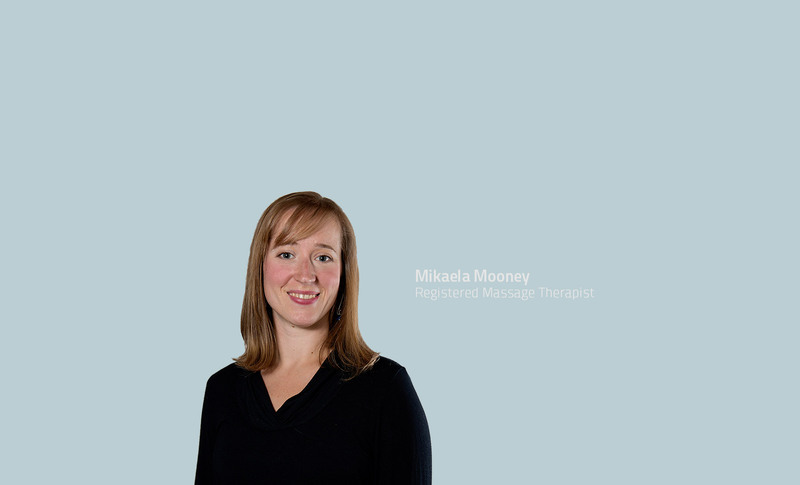 Mikaela’s goal with each of her clients is to provide the best evidence based care using a variety of techniques including, but not limited to, fascial release, Swedish massage, trigger point release, and joint manipulation. She also tries to inform and educate clients about their condition and its causes, what she hopes to achieve through her techniques, as well as a few simple things they can do to help speed their recovery.